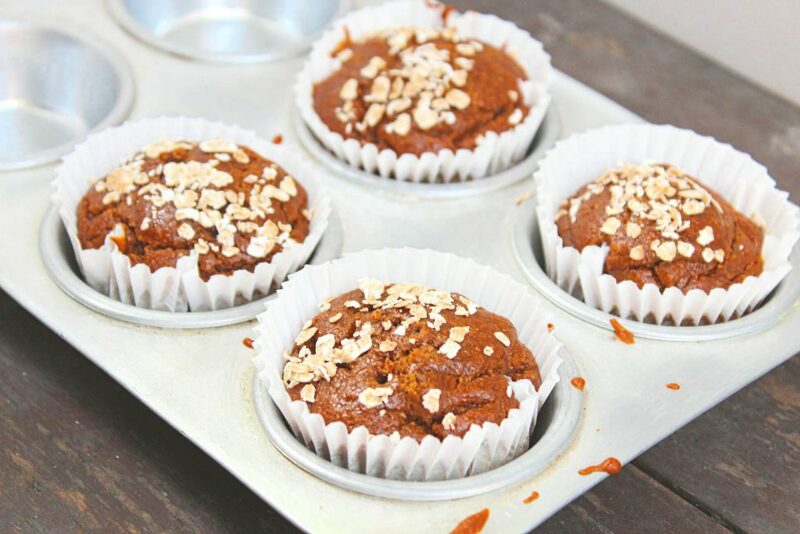 Healthy Banana Oats muffins : No Sugar, No Oil and No Egg. For preparing these banana muffins, all you need is a blender jar – Add all the ingredients into the blender, blend, bake and enjoy these easy and quick banana oats muffins. These banana oats muffins are the easiest muffins I had tried till now. The recipe is quite simple and gets prepared in just 20 minutes. 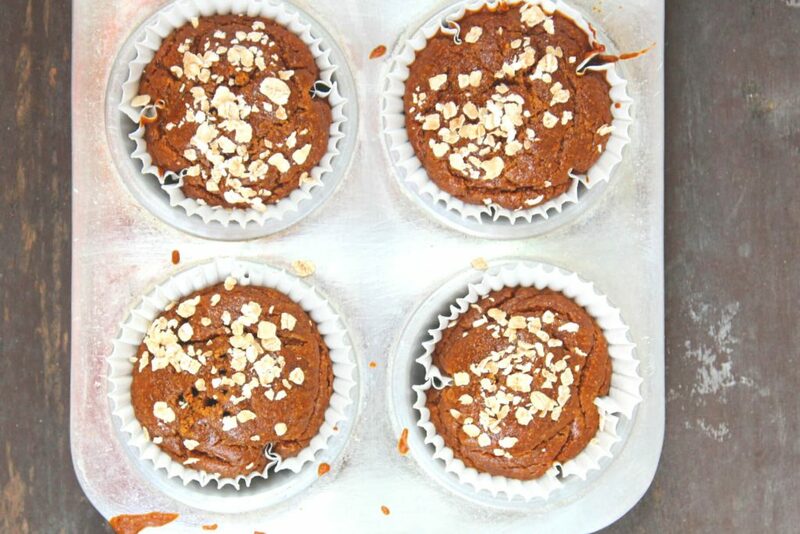 As these are healthy banana oats muffins, I have tried to reduce all the inorganic and unhealthy ingredients. I have avoided some of these. I have substituted some of these with their healthier alternatives. You can prepare these muffins at any time of the day. Just measure the ingredients, add them into the blender jar, blend, pour the batter into the muffin tin and bake these muffins. That’s it. You don’t need a hand blender or a hand whisk or a stand mixer for making these banana oats muffins. You don’t need a number of bowls for separately mixing the dry ingredients and the wet ingredients. Just make sure you are using a good blender. This is to make sure that all the ingredients get mixed properly. There should be no lumps in the batter, that is, the batter should be smooth. I have been using Wonderchef Nutri Blend since 2 years and I am quite satisfied with it. This is quite space friendly as it’s small in size and can be placed easily in the kitchen. Also, you don’t have to connect various parts for using the mixer. Just add the ingredients in any of the jars, place it on the main machine, twist it and it starts working. For stopping the mixer, just twist the jar back. It’s quite easy and simple. Another good thing is that the blades of this blender is amazing. In a short time span, it blends the ingredients into a smooth paste. You won’t find any lumps in the batter/chutney/paste etc. For making these muffins, I have used the largest jar in this set up. These are egg free and sugar free banana muffins. As I wanted these muffins to be on the healthier side, I have not added sugar in them. Instead I have used honey. Honey is a healthy replacement of sugar. There are many health benefits of honey. 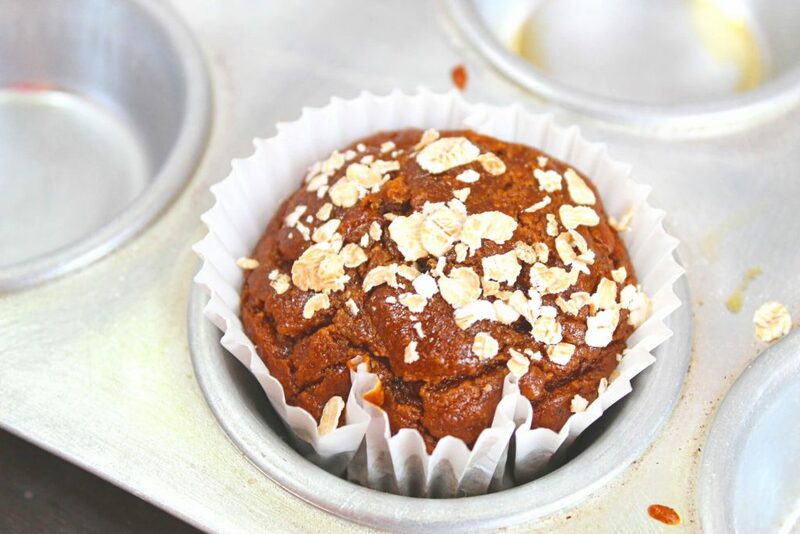 Therefore, I have used honey (in place of sugar) in these healthy banana oats muffins. Make sure to use good quality honey for best results. I have also not added eggs in these banana oats muffins. 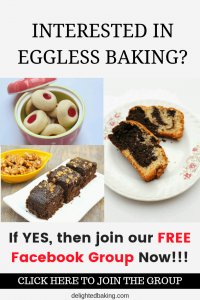 These are eggless muffins. Banana, itself, is one of the best substitutes of egg. It does the job of egg in this recipe and makes these muffins soft and moist. Yes! These muffins are oil free too. I have not used any oil or butter in these muffins. Instead of oil or butter, I have added a small amount of curd (yogurt) in these muffins. Yogurt does the job of oil/butter in these banana oats muffins. It is healthier than oil or butter and thus is a good replacement. Obviously, we can’t use all purpose flour, after removing so many other not so healthy ingredients, right? So, in place of all purpose flour, these muffins contain whole wheat flour. 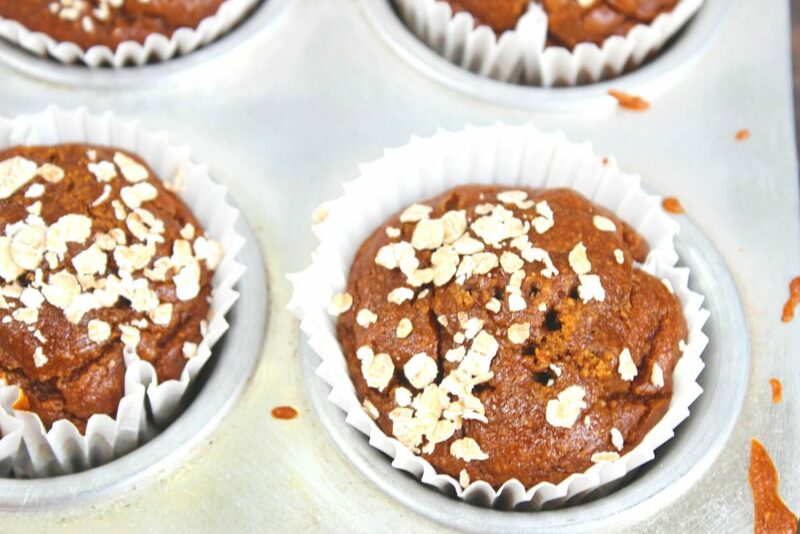 Whole wheat flour is definitely a great substitute for all purpose flour in these muffins. Another healthy addition in this recipe is oats. Oats are quite healthy. People usually eat oats in breakfast. You can add oats in pancakes, smoothies, cake, breads, cookies etc. You just have to add oats along with the other ingredients in the blender jar. If you want, you can roast them a little, before adding them into the blender jar for an added flavor. But this is totally optional. Whole Wheat Banana Muffins sure, if you are using any of these add ons, you add them at the last (after blending the rest of the ingredients). Don’t blend these along with the other ingredients. I added some oats on the top of muffin batter, before baking them. This is a totally optional step. You can also add chocolate chips or chopped almonds on the top. Note : As these muffins consists of healthier substitutes of some ingredients, these muffins take longer time to bake. Ideally muffins get baked in 15-20 minutes but these muffins take around 30-35 minutes (that is average time required for baking a cake). Do try this recipe. 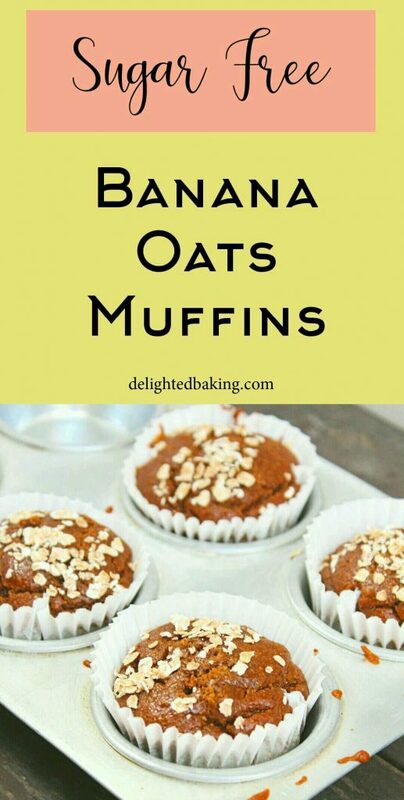 You can eat these healthy banana oats muffins during breakfast or you can eat them as a healthy snack as well. 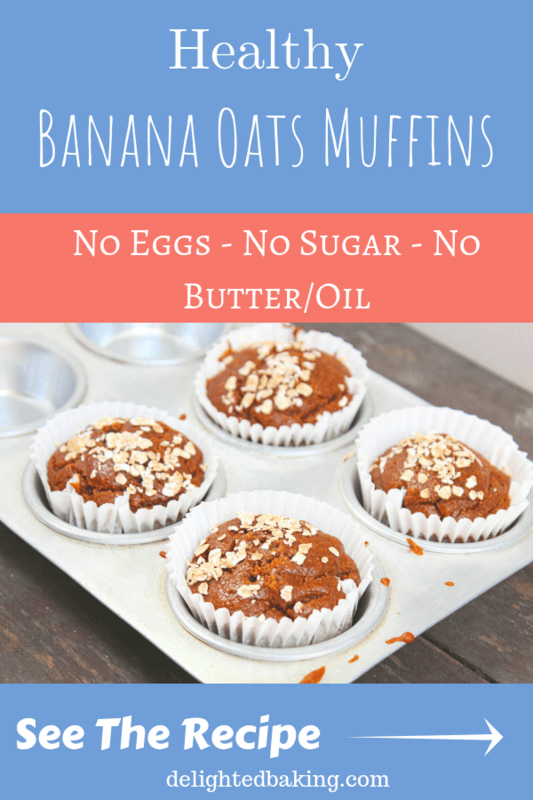 Healthy Banana Oats Muffins : No oil, No sugar and no eggs. Preheat the oven to 180 C / 350 F. Line a muffin tin with paper liners. 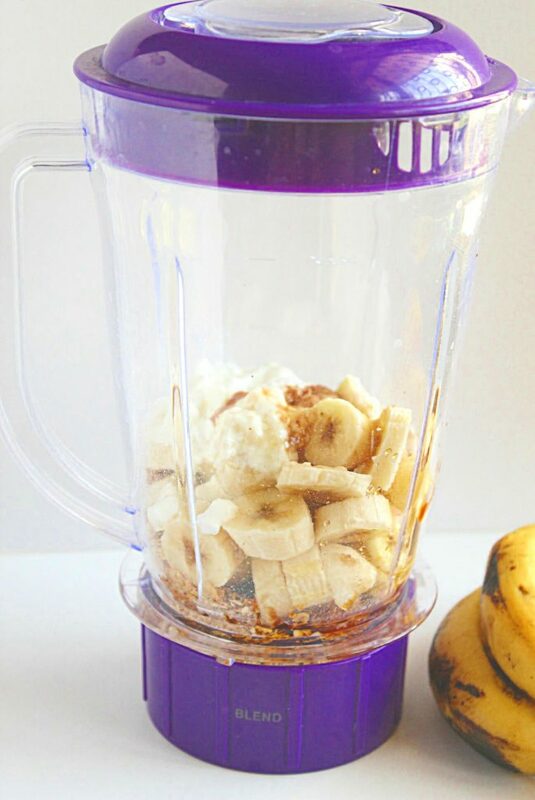 Add all the ingredients (Oats, whole wheat flour, honey, curd, vanilla essence, baking soda, baking powder and bananas) into a blender jar. Blend till you get a smooth muffin batter. You may have to stop the blender 2-3 times, scrape down the batter from the sides with a spatula and blend again. Pour the muffin batter into the muffin tin. Sprinkle some oats/chopped almonds/chocolate chips on the top. Bake at 180 C / 350 F for 30-35 minutes or till a toothpick inserted into the center of a muffin comes out clean. 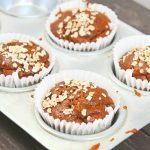 Healthy banana oats muffins (Banana blender muffins) are ready! « 45 amazing gifts for those who love baking! Oh my goodness these look amazing! Pinning this to make later!